The National Museum of Australia holds some surprising and unusual objects related to Australia's prime ministers. Ranging from the official to the personal, they provide an insight into the people who have led our country. A terracotta bust of Australia's first prime minister, Edmund Barton, acknowledges Barton's role in creating the nation. 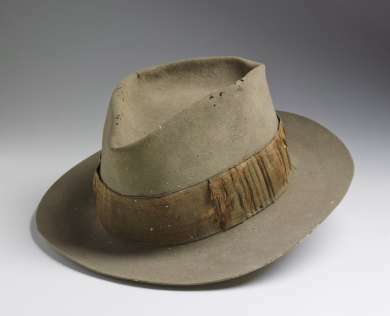 Ben Chifley's hat (pictured) and pipe, which he was rarely without, conjure up the man who was prime minister from 1945 to 1949. The barrister's wig belonging to George Reid represents his career before and after his prime ministership. Billy Hughes' walking stick speaks of his ongoing health issues. Robert Menzies was an enthusiastic filmmaker outside of parliament and recorded family events and political meetings on his cinecamera. The Museum's cartoon collections remember prime ministers as much for their quirks of personality and their relationship with the Australian public, as for their impact on Australian life. Discover more about Australia's prime ministers through the National Museum's Collection Explorer. Malcolm Fraser for delaying a censure motion for so long...".